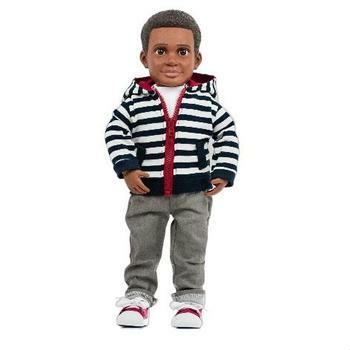 Boy Story of Tampa, Fla., is recalling about 8,500 Mason & Billy action dolls and Mason & Billy HeForShe special edition action dolls sold in the U.S. and Canada. The company has received about 32 reports of the vinyl breaking on the joints. No injuries have been reported. This recall involves four styles of Boy Story action dolls. They include the Mason and Billy Action Dolls, and the Mason and Billy HeForShe Special Edition Action Dolls. The recalled dolls are vinyl and measure 4 inches long by 7 inches wide by 18 inches high. They also came with outfits consisting of a button-up shirt, white t-shirt and jeans. Boy Story LLC is stamped on the left foot of each doll. The action dolls, manufactured in China, were sold online at www.biddleandbop.com and small retailers from December 2016, through May 2018, for about $100. Consumers should immediately take the recalled dolls away from children and contact Boy Story for instructions on how to receive a full refund of the purchase price. Consumers may contact Boy Story collect at (240) 670-0221 from 9 a.m. to 5 p.m. (ET) Monday through Friday, by email at questions@boystory.com or online at http://www.boystory.com/productrecallform.pdf for more information.